At Maharashtra’s Kalba Devi beach in Ratnagiri district it is difficult to tell where the Arabian Sea ends and the sand begins. At one spot, wading into the waves takes you into an abrupt stagnant pool of salt water about thigh deep. At another, waves, instead of coming straight on, flow in from sides into a long, deep trench-like formation, like a stream. During the evening high-tide one can only wonder at these strange phenomena, but at daybreak the reason becomes clear. 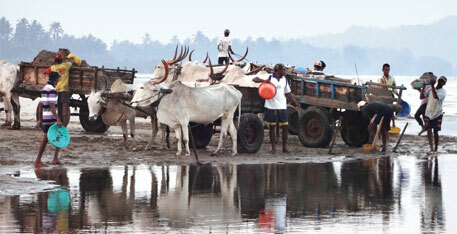 Near the stagnant pool, now exposed due to the low tide, about half a dozen bullock carts are parked, with men digging sand and loading it. One of them says he is taking sand to construct his house. But within an hour the number of carts doubles. All the carts take the same route out of the beach and return surprisingly fast. Beach sand mining is the least acknowledged form of sand mining in Maharashtra. Even as all kinds of sand mining in the state have been stopped through a ban by the National Green Tribunal (NGT) on February 4, beach sand mining continues. Illegal sand mining usually brings to mind pictures of huge dredgers or suction pumps extracting tonnes of sand from the depths of the earth. However, in Ratnagiri district, which is famous for mangoes, beach sand mining is exclusively manual—carried out by labourers—which makes it easy to pass off as small scale. Over 100 of the 400 families in Kalba Devi are involved in beach mining. “The poor landless, who were earlier subsisting on labour, are drawn to sand mining in a big way,” says Manish. Sand mining is easy money, he says. A team of two workers with one bullock cart earns around Rs 200 per cart of sand. “As a result, each worker earns between Rs 600 and Rs 800 by working for four to five hours. In comparison, labour fetches around Rs 150 for 10-12 hours of work,” he adds. Manish says the sand mafia has helped the poor families acquire bullock carts with pedigree bulls for mining. “Initially, the mafia was using trucks from outside to transport the sand but now there are 12 trucks in the village itself, acquired with the help of the mafia. Due to these acquisitions, the poor are now under debt, which makes them desperate for work.” One of the sand diggers, requesting anonymity, says he has taken a loan of Rs 1 lakh for buying a cart and a pair of bulls. He, however, refused to reveal who gave him the loan. Similar conditions prevail in nearby Nevre village. 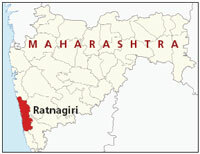 “Mining has been going on for at least seven years, despite regular panchayat injunctions to stop it,” says Majeed Ibrahim Hodekar, a former panchayat member. “The involvement of the poor is making things difficult,” he admits. Kalba Devi residents have been fighting against beach sand mining for the past six years—but with little success. “We have made several complaints to the district collector and the police, and drawn up several gram sabha resolutions opposing it. But within a month or two of administrative action, mining starts again,” says farmer Pramod More. 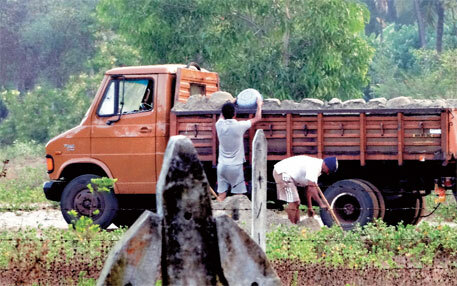 The residents have also faced violence and threats from the local sand mafia. Some two years ago, coconut trees in Manish’s resort were chopped overnight after he opposed mining. “The mafia has also set up a sand collection centre on a plot adjoining my resort,” he says. On January 26 this year, village residents had staged a protest against sand mining. Following this, the compound wall of one of the protesters was dashed by a sand truck. Within days of the protest, casuarina plantations on the village beach also caught fire, destroying hundreds of trees. “The tehsildar visited the village after the fire incident but mining resumed a month later,” says Vinod Mayekar, a resident. The village sarpanch, Jitendra Joshi, declined to talk to Down To Earth. Residents say Joshi has been fighting against the mafia, but panchayat members in favour of mining have moved a no-confidence motion against him. “The matter is in court and he has received death threats,” says Mayekar. In all the villages in Ratnagiri where mining is taking place, people report increased vulnerability to high tides during the monsoons. At Mirya Bandar village, which is some 30 km from Kalba Devi, a buffer of three-metre sand cover is all that stands between the ocean and the first row of houses. A village resident says the beach has disappeared due to rampant mining for over a decade. “Every night 40-45 trucks of sand are transported out of the village.” The government has now constructed a makeshift wall with sand bags along the shoreline. Bystanders say construction of village houses is the reason behind the depleting beach, which has left them worried. “My house is just six metres away from the shoreline. Water gets into my house every monsoon. Kindly ask the government to raise the height of the wall,” says one of them. In Kalba Devi, Manish More says last year the tides reached the gate of his home-stay, which is 800 metres from the shoreline. “Since mining started the sea has moved in by 400-500 metres,” he adds. In another part of the village, where the Kalba Devi creek joins the Arabian Sea, the distance between houses and the shoreline has reduced to barely 20 metres. “This part of the beach saw the heaviest mining in the early years, but the increased vulnerability forced miners to move further along the beach,” says Mayekar. Ratnagiri district collector B Radha- krishnan and district mining officer B B Salve deny sand mining activities on the beaches of the district. “We have taken action on complaints of sand mining in the creeks, but there are no complaints about beaches,” says Salve. Ratnagiri tehsildar M N Kamble who, villagers say, has taken action on complaints of sand mining, says the administration is planning strict action against the mining mafia in the district. People insist the local administration is in cahoots with the mafia. “All mining activities stop one day before a raid. This has been happening for years,” says Pramod. People also complain that the administration is selective in protecting beaches. “Beaches like Bhate and Ganapatipule, where political bigwigs like Padam Singh Patil and Manohar Joshi have interests in tourism, are well protected, but beaches with small tourism potential are being neglected,” says Manish. Grim indeed! Such and other modes of plunder continue. If we are all alert to this kind of assault on the environment maybe we can contain the insidious plundering. Great reporting Pallavi.